It’s hard to overstate the value of an education. An education can boost long-term earnings and open up new career paths. But it can be tricky to measure the precise impact of pursuing higher degrees. Is a high school diploma enough? Should you pursue a master’s degree? The answers to those questions may differ based on where you live. Below we analyzed the cities where earning more education pays off the most. Find out how much you need to save for retirement. In order to find where an education pays off the most, we compared income data for people with different levels of education. We compared earners without a high school degree to those with a high school degree; high school degree holders to associate’s degree holders, associate’s degree holders to bachelor’s degree holders and bachelor’s degree holders to graduate degree holders. Bachelor’s degrees offer the biggest boost – Across the 200 largest cities, earning a bachelor’s degree as opposed to an associate’s degree offers the biggest pay off. We found that bachelor’s degree holders earned 46% more than associate’s degree holders, on average. The second-biggest pay off comes from receiving a graduate degree. On average workers with graduate degrees earned 32% more than those with bachelor’s degrees. Tech cities favor education – Tech hubs like San Francisco and San Jose, California and Huntsville, Alabama secured spots in our top 10. In these cities getting a higher education can seriously boost earnings. In Huntsville, for example, workers with bachelor’s degrees earn almost twice as much as workers with associate’s degrees. Your mileage may vary – One thing many people learn soon after graduating is that what kind of specialized education you get matters. STEM fields in general tend to be the highest paying. If you are currently working in Jersey City and do not have your high school degree or its equivalent you are leaving a lot of money on the table. Our data shows the average Jersey City worker without a high school degree earns about $19,000 per year. Those with a high school degree earn almost $29,000, an increase of 51%. Similarly, earning a bachelor’s degree instead of an associate’s degree can lead to big increases in earning potential. Workers who hold bachelor’s degrees earn a whopping 83% more on average than workers with their associate’s degree. San Jose is part of Silicon Valley, a place where highly educated workers typically earn high salaries. Our data shows that by going back to school and getting a bachelor’s degree, workers with associate’s degrees could see their incomes rise by 83%, on average. It would also be valuable for those with bachelor’s degrees to pursue a graduate degree. According to our data, workers with graduate degrees out-earn those with a bachelor’s degree by $34,000 per year. One of the hardest-working cities in the country hustles its way into a three-way tie for third. Our data shows that bachelor’s degree holders in Arlington earn 108% more than associate’s degree holders, on average. In dollar terms that means by pursuing a bachelor’s degree, you could see annual earnings rise from $36,500 to $75,900, on average. For that specific metric, Arlington ranks first. Huntsville is known for its educated workers, and it tends to pay them well. Recently, we found that Huntsville was the sixth-best city to work in tech. This study backs up that finding. According to our data, earning a bachelor’s degree can pay off big time for Huntsville residents. The same is true for acquiring a graduate degree. Huntsville workers who have bachelor’s degree earn 98% more than those with associate’s degree. That’s the fourth-largest change in our study. When we compared the salaries of bachelor’s degree holders to those with graduate degrees, we found that graduate degree holders earned 60% more on average. Cary is the third city tied for third. While the cities Cary is tied with score well in one or two categories, Cary takes a well-rounded approach to boost its scores in the study. Cary ranks in the top third for all four metrics. Its best score comes from the average earning difference between workers with associate’s degrees and those with bachelor’s degrees. Our data shows the average worker with a bachelor’s degree in Cary earns 72% more than the average worker with an associate’s degree. 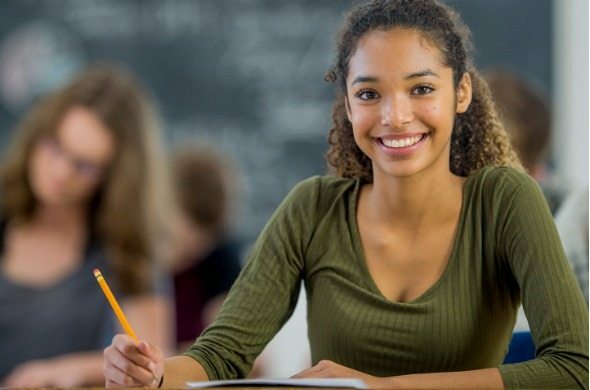 In Pasadena there is plenty to be gained by improving your education at all levels. According to our data, workers with a high school degree earn an average 58% more than workers without one. In terms of dollars, workers with a high school diploma out-earn those who did not graduate high school by $11,000 per year on average. Similarly, Pasadena residents with graduate degrees earn an average of 50% more than those with bachelor’s degree. Scottsdale is a tough place to work if you don’t have a high school diploma. Our data shows that workers who didn’t finish high school earn $13,700 per year, on average. By getting their high school degree, the workers may be able to improve their earnings by 102%, to $27,800, on average. For that metric Scottsdale ranks first. 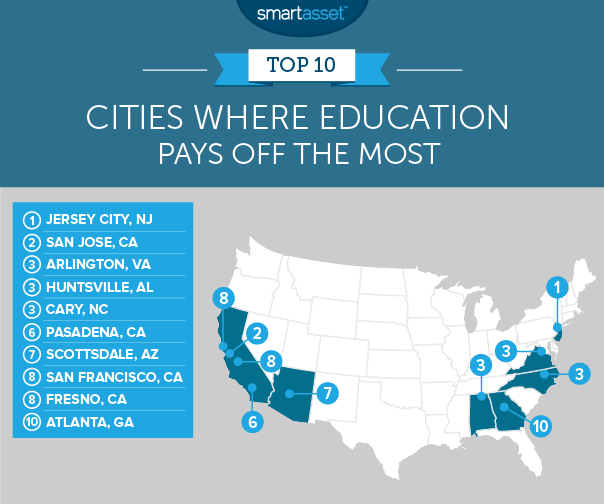 Interestingly, earning a graduate degree is less valuable in Scottsdale than it is in many other cities in the top 10. Our data shows that graduate degree holders earn 24% more than bachelor’s degree holders. 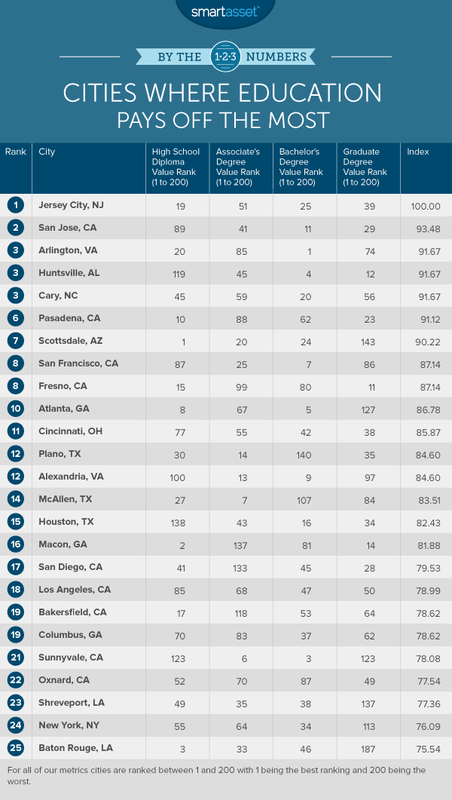 For this metric, Scottsdale ranks 143rd out of 200 cities. Going to college pays off for San Francisco workers. By furthering their education and earning an associate’s degree, those with high school diplomas may be able to improve their annual earnings by 35% (or $11,000). Similarly data shows that bachelor’s degree holders earn 85%, or $35,000, more per year than associate’s degree holders, on average. If you are working in Fresno with a bachelor’s degree and are wondering how to improve your income, consider getting a graduate degree. Census data shows that, on average, those with graduate degrees earn 60% more than those with bachelor’s degrees. In raw numbers that works out to about $28,000 more. We also see that it is worthwhile to get a high school diploma or its equivalent. On average workers who finish high school earn 53% (or $9,000) more than workers who don’t finish high school. Atlanta takes the final spot in our top 10. Two sets of workers in particular – workers who did not finish high school and workers with associate’s degrees – have the most to gain by improving their education in Atlanta. According to Census Bureau data, workers with high school degrees earn an average of 62% (or $8,800) more than those who don’t have a high school diploma. And completing a bachelor’s degree can almost double your earning potential. In Atlanta, workers with associate’s degrees earn $28,500 per year on average and workers with bachelor’s degrees earn an average of $56,500. Value of a high school degree. This is how much more workers with a high school degree earn compared to workers without a high school degree. This is measured as a percent change. Data comes from the U.S. Census Bureau’s 2016 1-Year American Survey. Value of an associate’s degree. This is how much more workers with an associate’s degree earn compared to workers with a high school degree. This metric is measured as a percent change. Data comes from the U.S. Census Bureau’s 2016 1-Year American Survey. Value of a bachelor’s degree. This is how much more workers with a bachelor’s degree earn compared to workers with an associate’s degree. This metric is measured as a percent change. Data comes from the U.S. Census Bureau’s 2016 1-Year American Survey. Value of a graduate degree. This is how much more workers with a graduate degree earn compared to workers with a bachelor’s degree. This metric is measured as a percent change. Data comes from the U.S. Census Bureau’s 2016 1-Year American Survey. First, we ranked each city in each metric. Then we found each city’s average ranking, giving an equal weight to all metrics. Using this average ranking, we created our final score. The city with the best average ranking received a 100. The city with the worst average ranking received a 0. Just like how homeowners can deduct mortgage loan payments from their taxes, so can graduates with student loans. You can deduct up to $2,500 under the federal student loan interest deduction. However, if Republicans’ new tax reform bill passes into law, this deduction will be eliminated. One option for lowering your student debt load is refinancing. By refinancing your student loans to a lower interest rate, you can save yourself thousands of dollars over the course of your loan.